This diagram illustrates the program's timeline and sequence of intensive study and courses (click to enlarge). Pre-intensive study assignments will be available through the online platform you will use throughout the program. 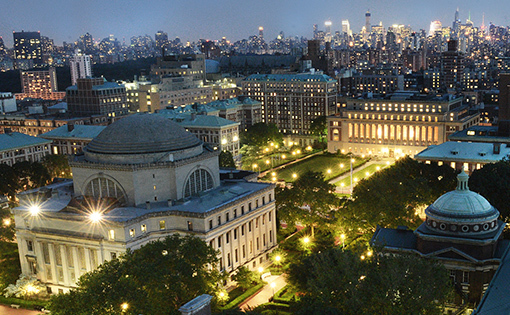 Students start the program with five days of intensive study in New York City. Instructional hours for two core courses (Technology in the Business Environment and Accounting and Finance for Technology) will begin, as well as Seminar 1: Product or Service Realization, complemented by additional intensive study activities designed to immerse all participants in a collaborative exploration of technology leadership roles and their importance to organizations. Intensive study activities will involve the active participation of faculty, outside industry experts, selected program mentors, and alumni, and will include sessions at company sites and social events. Students gather in New York City for a five-day global intensive study led by program faculty. 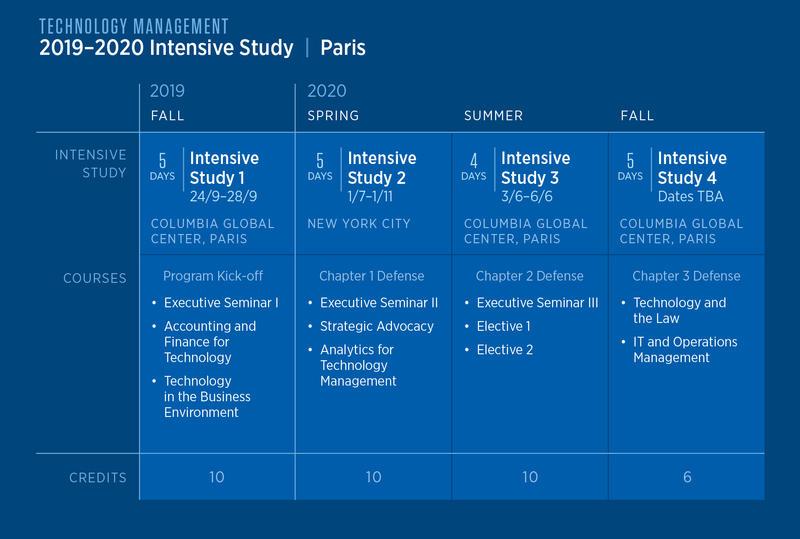 The intensive study includes instructional hours for two core courses (Behavioral Challenges in Technology Management and Strategic Advocacy for Technology Executives) and Seminar 2: Strategic Planning and Marketing. Students also have their oral defense for Chapter 1: Product or Service Realization. The design of the intensive study allows U.S. students and European students to gather together and take part in activities in and out of the classroom. 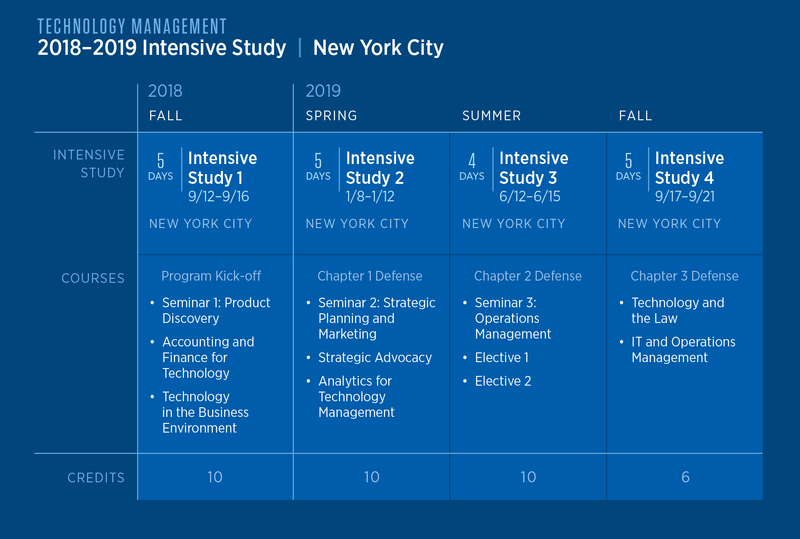 Students complete a four-day intensive study in New York City, with their second oral defense Strategic Planning & Marketing, as well as Seminar 3: Operations Management. During the Summer Term students select two elective courses based on their area of focus. Students take these courses online; some courses may have face-to-face options available. Students complete a final, five-day intensive study in New York City. The intensive study includes instructional hours for two core courses (Technology and the Law and IT and Operations Management) as well as the final oral defense of Chapter 3: Operations Management. 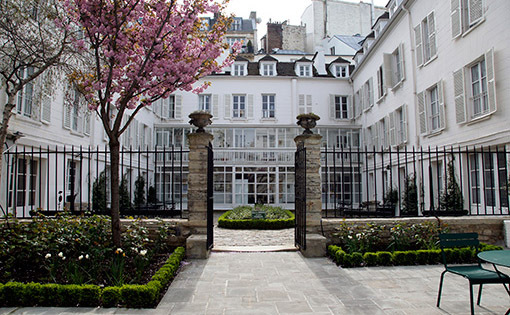 Students first meet in person at Columbia Global Centers | Europe in Paris for five days of intensive study. Instructional hours for two core courses (Technology in the Business Environment and Accounting and Finance for Technology) will begin, as well as Seminar 1: Product or Service Realization, Additional intensive study activities designed to immerse all participants in a collaborative exploration of technology leadership roles and their importance to organizations complement the coursework. Intensive study activities will involve the active participation of faculty, outside industry experts, selected program mentors, and alumni, and will include sessions at company sites and social events. Students gather in New York City for a five-day global intensive study. 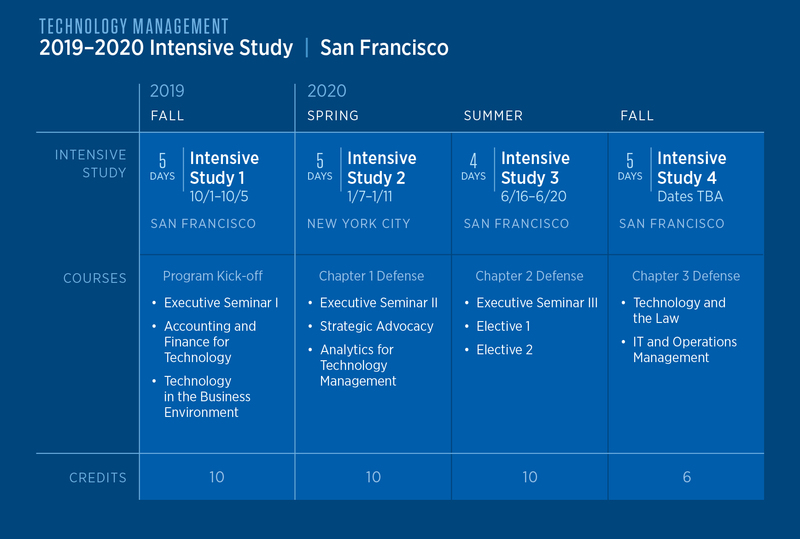 The intensive study includes instructional hours for two core courses (Behavioral Challenges in Technology Management and Strategic Advocacy for Technology Executives) as well as Seminar 2: Strategic Planning and Marketing. Students also have their oral defense for Chapter 1: Product or Service Realization. The design of the intensive study allows U.S. students and European students to gather together and take part in activities in and out of the classroom. 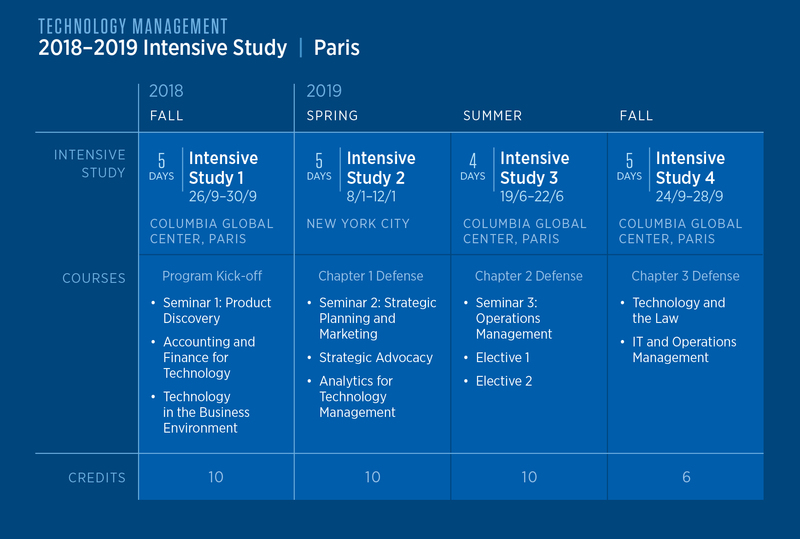 Students complete a four-day intensive study at Columbia Global Centers | Europe, with their second oral defense Strategic Planning & Marketing, as well as Seminar 3: Operations Management. Students complete a final, five-day intensive study at Columbia Global Centers | Europe, which includes instructional hours for two core courses (Technology and the Law and IT and Operations Management) as well as the final oral defense of Chapter 3: Operations Management. Students first meet in person in San Francisco for five days of intensive study. Instructional hours for two core courses (Technology in the Business Environment and Accounting and Finance for Technology) will begin, as well as Seminar 1: Product or Service Realization. Additional intensive study activities designed to immerse all participants in a collaborative exploration of technology leadership roles, and their importance to organizations, complement the coursework. Intensive study activities will involve the active participation of faculty, outside industry experts, selected program mentors, and alumni, and will include sessions at company sites and social events. Students gather in New York City for a five-day global intensive study. 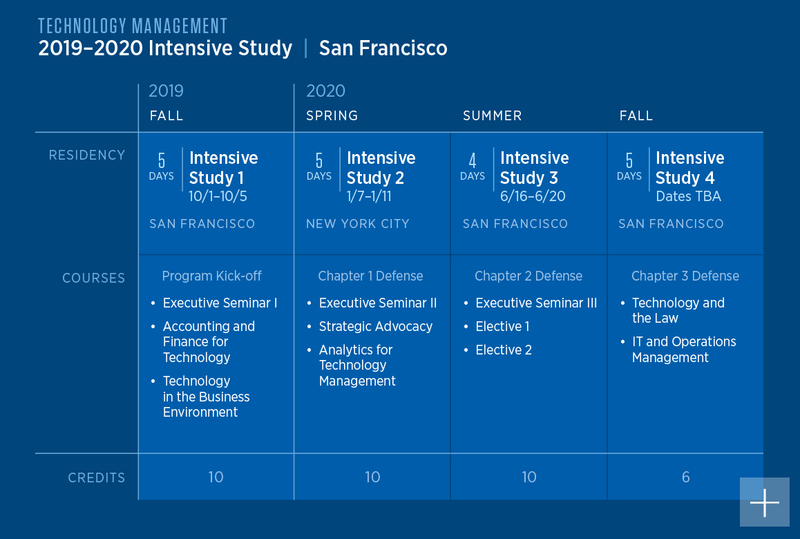 The intensive study includes instructional hours for two core courses (Behavioral Challenges in Technology Management and Strategic Advocacy for Technology Executives) as well as Seminar 2: Strategic Planning and Marketing. Students will also present their oral defenses for Chapter 1: Product or Service Realization. The design of the intensive study allows the NYC, San Francisco, & Paris students to gather together and take part in activities in and out of the classroom. Students complete a four-day intensive study in San Francisco, which solely revolves around Seminar 3: Operations Management. In addition, students will present their second oral defense on Strategic Planning & Marketing. During the Summer Term students select two elective courses based on their area of focus. Students complete these courses online. 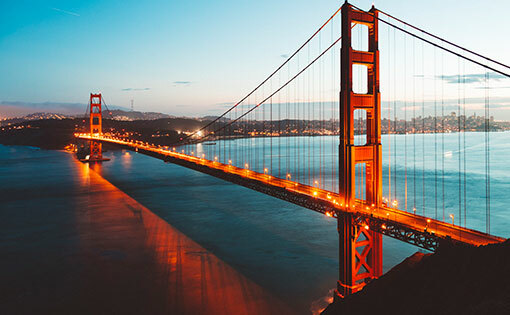 San Francisco will also host the final, five-day intensive study, which includes instructional hours for two core courses (Technology and the Law and IT and Operations Management). These students will also complete their Master’s Project by presenting their Final Chapter: Operations Management. In order to receive their Executive M.S. degree, students must complete the requirements of the 16-month Executive program, which includes attending all four intensive studies. In addition, students must have an overall grade point average of 3.0 (B) or better. The 36-point program is composed of eight 3-point courses and three 4-point Executive Seminars.